Please note that all weapons shown here and/ or owned by members of this group are legally deactivated or are held on approved fire arms licences. The Lee–Enfield takes its name from the designer of the rifle's bolt system (James Paris Lee) and the factory in which it was designed (the Royal Small Arms Factory in Enfield). No4MkI’s were made by several factories during the 2nd World War. The bulk by the Royal Ordinance factory Maltby, ROF Fazakerley, BSA Shirley, with smaller quantities at Longbranch in Toronto Canada and by the Stevens-Savage company of Chicopee Falls, Massachusetts, USA. The fast-operating Lee bolt-action and 10-round magazine capacity (which was loaded with the .303 British cartridge manually from the top, either one round at a time or by means of five-round chargers) enabled a well-trained rifleman to fire 20 to 30 aimed rounds in 60 seconds, making the Lee–Enfield the fastest military bolt-action rifle of the day. The accuracy the No4 was expected to achieve was hitting a 6×4 inch plate at 100 yards. 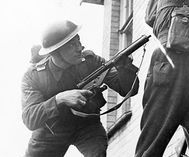 The Sten (or Sten gun) was a family of British 9 mm submachine guns used extensively by British and Commonwealth forces throughout World War II. Sten is an acronym, from the names of the weapon's chief designers, Major Reginald V. Shepherd and Harold Turpin, and EN for Enfield. 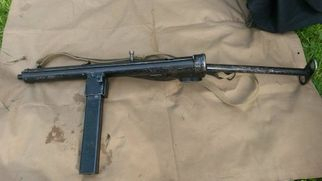 The Sten used simple stamped metal components and minor welding, which required a minimum of machining and manufacturing. Much of the production could be performed by small workshops, with the firearms assembled at the Enfield site. Over the period of manufacture the Sten design was further simplified: the most basic model, the Mark III, could be produced from five man-hours work. Some of the cheapest versions were made from only 47 different parts. It was distinctive for its bare appearance (just a pipe with a metal loop for a stock), and its horizontal magazine. The magazine held approximately 30 rounds of 9mm pistol ammunition, with a rate of fire of roughly 500 rounds per minute dependant on make of Sten. However the open-bolt firing and use of pistol ammunition severely restricted accuracy, with an effective range of around 100m, and the weapon was very prone to misfires and jams. The Bren was a modified version of Czechoslovak-designed light machine guns, the ZB vz. 26 and its descendants, which British Army officials had tested during a firearms service competition in the 1930s. The later Bren featured a distinctive top-mounted curved box magazine, conical flash hider and quick change barrel. The name Bren was derived from Brno, Moravia, the Czechoslovak city where the Zb vz. 26 was originally designed (in the Zbrojovka Brno Factory), and Enfield, site of the British Royal Small Arms Factory. 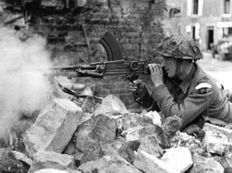 The Bren was a gas-operated weapon, which used the same .303 ammunition as the standard British rifle, the Lee–Enfield, firing at a rate of between 480 and 540 rounds per minute (rpm). 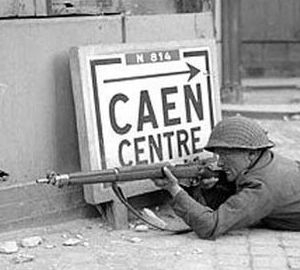 The Bren had an effective range of around 600 yards (550 m) when fired from a prone position with a bipod. Initial versions of the weapon were sometimes considered too accurate because the cone or pattern of fire was extremely concentrated. Soldiers often expressed a preference for worn-out barrels in order to spread the cone of fire and increase suppressive effects. 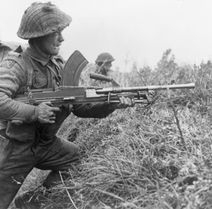 The machine gun was operated by a two-man crew, sometimes commanded by a Lance Corporal as an infantry section's "gun group", the remainder of the section forming the "rifle group". 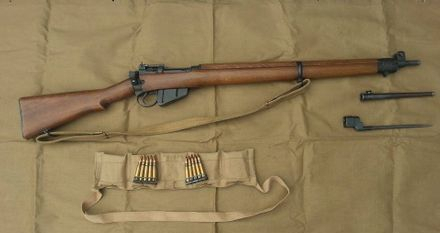 The gunner or "Number 1" carried and fired the Bren, and a loader or "Number 2" carried extra magazines, a spare barrel and a tool kit. Number 2 helped reload the gun and replace the barrel when it overheated, and spotted targets for Number 1. 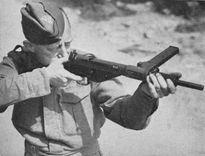 As well as the ammunition carried by the Gun Group, every rifleman in the section carried 2 magazines for the Bren, allowing it to keep up supporting fire for the section.